The ultimate upgrade for your 1/16 E-Revo VXL. 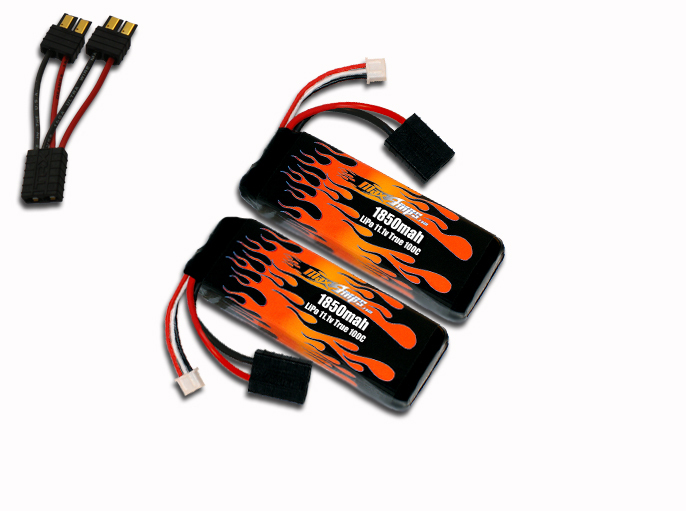 This is for 1 pair of our new 1850 11.1V lipo packs. One left side and one right side custom wired to fit the E-Revo VXL battery compartment with no modifications required. By using these packs in parallel, you will be running a 3700 11.1V setup. This will double your run time. Note: Running these packs together requires a 16awg Traxxas Parallel Adapter. You may add one by selecting it from the drop down menu on this product. Do NOT run these packs in series when using them in the new Traxxas E-Revo VXL or you will damage your system. They are only to be run in parallel which doubles the capacity instead of the voltage. These are the most powerful 1/16 compatible lipos on the market! And they keep the power flowing through out the charge!